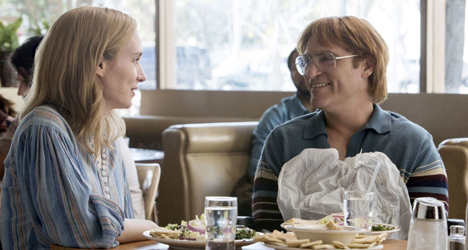 (From left) Rooney Mara and Joaquin Phoenix star in Gust Van Sant's "Don't Worry He Won't Get Far on Foot." 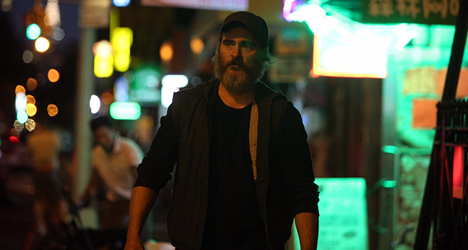 Three-time Oscar-nominated actor Joaquin Phoenix (“The Master”) stars as quadriplegic cartoonist John Callahan in “Don’t Worry, He Won’t Get Far on Foot,” a conventional biopic stifled by a screenplay that doesn’t allow its main character to flourish or make meaningful relationships. 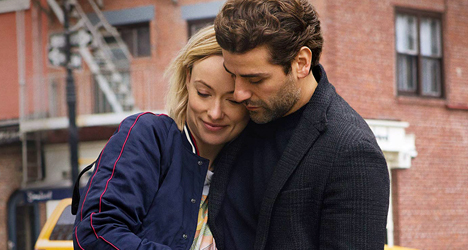 Directed by two-time Oscar nominee Gus Van Sant (“Good Will Hunting”), who made one of the most memorable biopics of the last decade in 2008’s “Milk,” works off his own script based on John’s memoir of the same name. Although writing has been, at best, an inconsistent endeavor for Van Sant in the past, what saves “Don’t Worry” from losing its footing completely is Phoenix’s portrayal of the controversial Callahan, who we see in the film through flashbacks as an alcoholic 21-year-old kid from Portland, who becomes paralyzed in a drunken car accident in 1972. Most of “Don’t Worry” focuses on John’s physical and emotional recovery after the crash as well as his effort to kick his drinking habit by finding support in Alcoholics Anonymous. In AA, he meets Donnie (Jonah Hill), the group’s leader whose easy-going demeanor keeps John’s addiction in check. Despite the importance of Donnie and the other AA members, Van Sant’s script keeps them at an arm’s length away and never really acknowledges their value. The same can be said with the way Van Sant handles John’s love interest Annu (Rooney Mara), a Swedish physical therapist who feels like an afterthought as soon as she leaves the room. An hour into the film and it’s almost like John has been alone the entire time. Even more problematic is the fact that because of the way the narrative is constructed, John’s artwork, the most fascinating thing about his life from a cinematic standpoint, only makes an impression in the second half of the story. When his cartoons are given their moment to shine, however, is when “Don’t Worry” becomes a charming inside look into a man’s comically dark and clever mind through the politically-incorrect doodles he creates on issues like physical disabilities, race, religion and anything else that would cause conservative readers to gasp. Van Sant enhances some of these scenes by having John’s drawings come alive on paper. The subtle animations of his scribbly characters bring a happiness to the picture that balances the sobriety storyline well. Still, it’s too little too late for “Don’t Worry” when we get to anything that resembles a significant part of who John really is – from his artistic abilities to his friendships to some of the personal baggage that weighs him down. Phoenix gives a triumphant performance, but “Don’t Worry” needed more color – something like 2003’s superior “American Splendor.” Van Sant, unfortunately, thought it adequate enough to scribble in pencil.